Sometimes I think our personal faith ebbs and flows with how high a view we have of God’s faithfulness. When our faith falters, we are actually doubting the faithfulness of God to come through with what He has promised us. Our view of God’s character and His faithfulness directly correlates to our ability to find peace in Him. A.W. Tozer wrote “What comes into our minds when we think about God is the most important thing about us.” If we have a high view of God we think one way of God and if we have a low view, we think another. The Bible speaks clearly of God’s character and His faithfulness. It also continuously reminds us of our need to “walk by faith and not by sight”. We need to trust because we are trusting in an Almighty God, the Creator of the universe, a faithful God. Our “faith is the assurance of things hoped for, the conviction of things not seen.” (Hebrews 11:1). It is only by our faith in a faithful God that will be find peace in Him. It is our lack of faith that keeps us from that peace. God’s nature or character is immutable, that is, it remains the same. God does not change, indeed, he cannot change, both in his being or in his will. It is this constancy of character that is His very nature or essence that we rely on. This constancy guarantees that He will remain faithful, because His character and essence demands it. The Psalmist tells us “The works of his hands are faithful and just; all his precepts are trustworthy; they are established forever and ever, to be performed with faithfulness and uprightness. He sent redemption to his people; he has commanded his covenant forever. Holy and awesome is his name!” (Psalm 111:7-9). We need to fully understand the character of God to the extent that our finite minds are capable. God is faithful! He will remain faithful because He is God and His character is unchangeable. He is perfectly faithful, because our God is “The Rock, his work is perfect, for all his ways are justice. 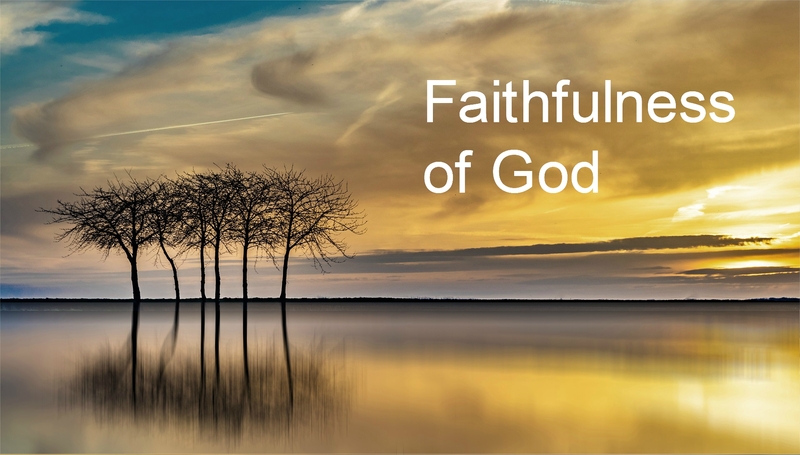 A God of faithfulness and without iniquity, just and upright is he.” (Deuteronomy 32). Ours is a faithful God, who never broke a promise and never violated a covenant. We can count of this because our God has assured us “I will not violate my covenant or alter the word that went forth from my lips.” (Psalm 89:34). Our faith needs to be anchored on that “Rock”. The writer of Hebrews sums it up pretty well. “So when God desired to show more convincingly to the heirs of the promise the unchangeable character of his purpose, he guaranteed it with an oath, so that by two unchangeable things, in which it is impossible for God to lie, we who have fled for refuge might have strong encouragement to hold fast to the hope set before us. We have this as a sure and steadfast anchor of the soul, a hope that enters into the inner place behind the curtain, where Jesus has gone as a forerunner on our behalf.” (Hebrews 6:17-20). It seems pretty clear that we, as the “heirs of the promise”, because of the “unchangeable” character of God, must “hold fast to the hope set before us.” The two unchangeable things are God’s promise and His pledge, His promise and His oath. They are without any possibility of change or variance. God has imparted this hope to us as a “sure and steadfast anchor” for our soul. Our hope in this life will flow naturally from our faith in the promises of God. No faith, no hope. If we have no faith in a faithful God we will have no hope in what He has promised to us. If we do not believe that His steadfast love extends to the heavens, and His faithfulness to the clouds, we will never find true peace in our lives. One last thought to contemplate. As we read through the following passage from the Psalmist, and contemplate the faithfulness of God, we need to see how all-encompassing His love is toward us is. Take heed and live by faith in a faithful and true God. Therein lies our peace. “The Lord is my light and my salvation; whom shall I fear? The Lord is the stronghold of my life; of whom shall I be afraid? When evildoers assail me to eat up my flesh, my adversaries and foes, it is they who stumble and fall. Though an army encamp against me, my heart shall not fear; though war arise against me, yet I will be confident. One thing have I asked of the Lord, that will I seek after: that I may dwell in the house of the Lord all the days of my life, to gaze upon the beauty of the Lord and to inquire in his temple. For he will hide me in his shelter in the day of trouble; he will conceal me under the cover of his tent; he will lift me high upon a rock. …” (Psalm 27:1-14). ← My help comes from the Lord, who made heaven and earth.